Please vote for me just by clicking. Thank you! Easter Best. Chick Magnet Tee. Next Model Search. $100,000 Scholarship! 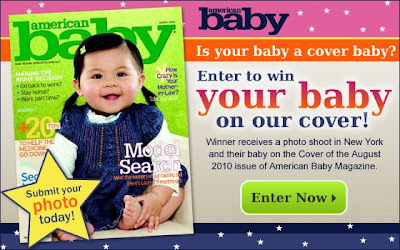 American Baby Magazine's online photo contest is now officially open. between the ages of three months and 24 months as of the date of entry. August 2010 issue of American Baby Magazine. The deadline is March 31, 2010. Visit the American Baby website for more information.